Tavern Jazbina is located at No 89 Bulevar Kralja Aleksandra Street, while entrance in this tavern is from Luke Vukalovića Street. This popular tavern is opened six years ago and for that time has gained large number of regular guests as well as great reputation. 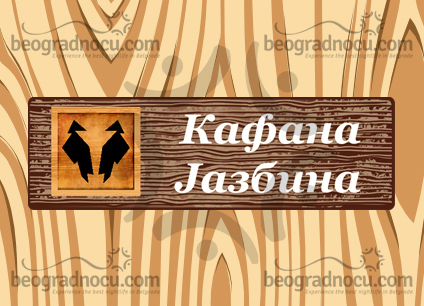 Tavern Jazbina is one of most beautiful bohemian taverns in Belgrade and is synonym for night life. To its guests tavern Jazbina always provides maximal pleasure and delights of bohemian life. Tavern Jazbina is definitely synonym for great fun and for your pleasure is opened until 2 am. Tavern Jazbina is one rare taverns that is opened seven days a week and is always there to provides you unforgettable night out. Every day tavern Jazbina is offering you great fun with daily drink promotions. Depending on a day you can have promotions of rakija, Johnnie Walker, Smirnoff and other drinks. Important thing is even though there are no promotions, prices are very affordable and adjusted to everyone's pocket. Interior really satisfies aesthetic criteria. Interior is mostly in brick and wood with mystique illumination. As far as for music program it meets up with high standards. Music genre in tavern Jazbina is mostly pop and folk and traditional music. Music repertoire is carefully selected with only one goal: so guests here are very satisfied and leave this tavern with smile on their face. Musicians here know how to feel audience and how to adjust music to guest structure and their desires. In tavern Jazbina fun is always guaranteed. Tavern Jazbina accommodates 160 people and atmosphere here is always on high level. Tavern Jazbina is just the place where you enter alone and leave it with two best friends. Whenever you visit tavern Jazbina you will have unforgettable time and you will not regret it.